The number of people living in poverty in America rose to 43.6 million in 2009, the US Census Bureau reported Thursday. This is the largest number since the agency began making such estimates 50 years ago and represents an increase of 3.8 million compared to 2008. As of last year, one in every seven Americans was poor, according to the government’s definition of poverty. The official poverty rate of 14.3 percent is the highest since 1994. The census report gives something of a historical dimension to the fluctuations in the poverty rate in the United States. The 2009 total of 43.6 million is the highest figure since the Census Bureau first began estimating poverty in 1959, arriving at a total of 40 million. 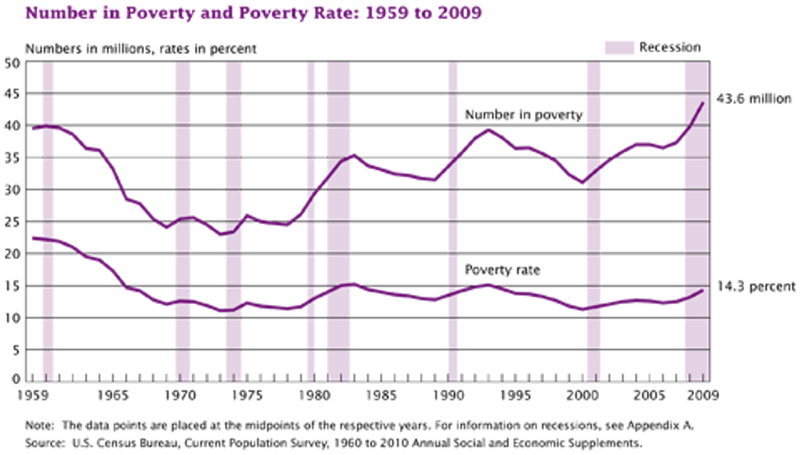 The number living in poverty fell to 30 million by 1965, as economic conditions improved during the postwar boom. The “War on Poverty” launched by Lyndon Johnson in that year had some success, cutting the number of poor to a low of 23 million just before the 1974-75 recession. The number living in poverty rose sharply in the 1980s, reaching 40 million 1993, then fell significantly to 31 million in 1999. It has increased steadily since then, a process that accelerated dramatically with the onset of the slump. Reflecting the impact of the economic slump and mass layoffs and wage-cutting, the increase in poverty was concentrated among working-age adults and their children, with the poverty rate for those 65 and older actually falling from 9.7 percent to 8.9 percent. The poverty rate for children rose from 19.4 percent to 20.7 percent, and the poverty rate for working-age adults rose from 11.9 percent to 12.7 percent. Poverty increased for all racial and ethnic groups, but was far higher for blacks and Hispanics. The poverty rate for blacks was 25.8 percent, and for Hispanics 25.3 percent. For whites the poverty rate was 9.4 percent, up from 8.6 percent in 2008. An entire section of the report was devoted to health insurance coverage. The massive elimination of jobs over the past two years has had a devastating effect on health care coverage, which in the United States is largely employment-based. The number of people without health insurance topped the 50 million mark in 2009 for the first time since such statistics began to be collected, in 1987. The figure rose from 46.3 million in 2008. Some 16.7 percent of the population is without health coverage, up from 15.4 percent in 2008. This figure is understated, since an individual had to be without coverage for the entire year to be counted as uninsured. A worker laid off in July 2009 and losing his or her coverage three months later would be counted as insured for the year. The number of people with government-sponsored health coverage rose from 87.4 million to 93.2 million due to increased enrolment in Medicaid, Medicare and the Children’s Health Insurance Program. But this was more than offset by a drop in the number of people with private insurance coverage, which fell from 201 million to 194.5 million. Only 55.8 percent of the population has job-based health insurance. • Household income stagnated in 2009, declining slightly to $49,777, from $50,112 in 2008. • Women who worked full-time, year-round earned only 77 percent of the income of men who worked similar hours. • Median income declined between 2008 and 2009 by 4.4 percent for black households and by 1.6 percent for non-Hispanic white households. • Regionally, median income dropped 2.1 percent last year in the Midwest, hardest hit by the collapse of industry, 1.9 percent in the West, the center of the housing collapse, and was unchanged in the South and Northeast. • Compared to the pre-recession peak in 1999, median household income was down 11.8 percent for blacks, 7.9 percent for Hispanics, 5.7 percent for Asians and 4.2 percent for whites. • Income inequality continues to increase. In 2009, the top 20 percent received 50.3 percent of all income, and the top 5 percent received 21.7 percent of all income. • Even before the onset of the recession, poverty was a familiar experience to one-third of all Americans. From 2004 to 2007, some 31.6 percent of the population lived in poverty for at least one period of two months or more. The current slump has already driven up the poverty rate by 1.9 percentage points and the total living in poverty by 6.3 million, including 2.1 million children. This is larger than during any other recession since World War II, with the exception of the 1980-81 and 1981-82 recessions combined, when the number living in poverty rose by 10 million. Equally significant is the large number of Americans just barely above the official poverty line, subsisting on incomes that are completely inadequate for a decent life. Extended unemployment benefits, for example, kept 3 million families above the poverty line last year. These benefits were allowed to expire three times this year already, and are likely to end completely after the November election, plunging millions of working people into destitution. Sawhill added that her research suggested the recession would add 10 million people to the poverty rolls, including 6 million children, by the middle of this decade. There is ample reason to believe that the actual poverty level is far higher than that reported by the Census Bureau. The official poverty threshold is set ridiculously low, at an annual income of $22,050 for a family of four or $10,830 for a single adult. It is not adjusted for geographical location, and accordingly greatly understates the poverty level in high-cost areas like New York City, Boston, Washington DC and California. The census survey excludes significant sections of the population: more than 2 million prisoners, elderly people living in nursing homes and long-term-care hospitals, and students living in college dormitories. Many if not most of these would be classified as poor if they were not living in institutional settings. The poverty line is also grossly out of date, since it is based on a 50-year-old formula derived from a period when food was the single largest expense in family budgets, most women did not work outside the home, most young people did not attend college, and the typical family had only one car. It therefore understates the impact of rising costs for health care, education, child care, transportation and other necessities. In addition, as the census report noted, there has been a large increase in the number of individuals and families doubling up, mainly for economic reasons. Combining several families or unrelated individuals into a single household has the effect of reducing the official poverty rate, which is calculated on a household basis. The poverty figures demonstrate both the bankruptcy of American capitalism and the failure of the Obama administration. The White House greeted them with a perfunctory nod. Obama issued a five-paragraph statement conceding that the census data “illustrates just how tough 2009 was,” while boasting that the stimulus bill adopted early last year had prevented an even worse situation from developing. “It could have been worse” is the only argument the Obama administration can make heading into the fall election campaign, but it is doubtful that the millions of workers who have lost their jobs, health insurance and homes over the past two years draw any comfort from it. This rhetorical flourish might be translated as follows: As the chief political representative of American capitalism, I am amazed that there has not yet been a mass upheaval among American workers against both my government and the financial aristocracy it serves. I hope to be able to delude working people with rhetoric about “hope” and “change” for at least a few more years. While arrogantly dismissing the plight of tens of millions of poverty-stricken Americans in a brief written statement, Obama devoted most of his working day to meeting with two groups of corporate CEOs: the President’s Export Council, which seeks to promote the competitiveness of US industries by cutting their costs, including labor costs; and leaders of 100 of the biggest corporations, who gathered to insure that the administration’s education policy is aligned with the needs of corporate America.